question: Because I need space, I deleted Apple's music program GarageBand. However, the optimization helper shows on "About this Mac / disk / Manage" still far below 20 GB of in music creation. How can I get rid? 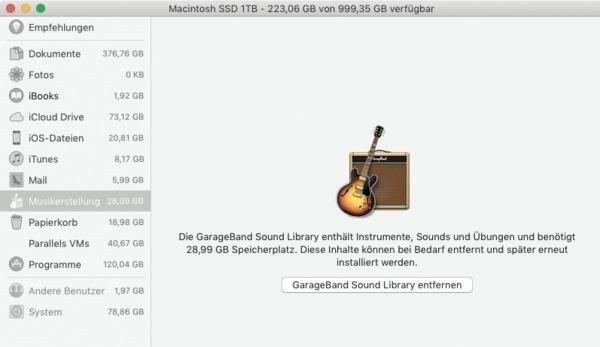 Mac & i responds: throwing GarageBand to the Trash and empty it, may be only the first step to uninstall, because the Apple software stores its sound libraries at different locations in the Library folder of macOS. This is also because, that GarageBand parts of it shares with the professional software Logic Pro from Apple. To clear the area occupied by GarageBand Place, is not it enough, to throw the resource-hungry app to the Trash. Then select the Finder menu "Go / Go to Folder ...", tap one line in the text field of the appearing dialog and click on "Open". You'll see in the Finder the contents of this folder. Check to ensure once again based on the name in the header, whether you are in the desired folder, and then delete the entire contents (Mark with Cmd + A all the files and place with Cmd + Backspace to trash; , you must enter your administrator password). The contents of Logic- and the Apple Loops folder you should only dispose, if you do not want to use in addition to GarageBand and Logic Pro. You can then use the above method you check again, whether the desired memory location is now free.